Wondering what to do at this sleepover? If you girls just want to have fun, read the fun sleepover pranks for girls to make a night to remember! Who cares about boys when girls can have all the fun? At girls' night out or a girls' night in, having fun is inevitable! Women know how to make a night to remember with sleepover pranks to last a lifetime. Playing pranks, at slumber parties makes the night interesting and fun. Break a leg to do something out of the box that will make your time with your girlfriends memorable. 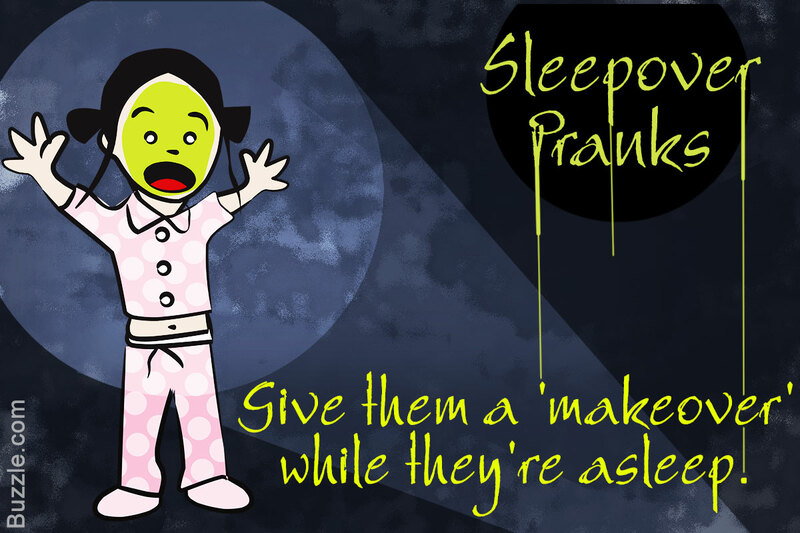 To play this prank for sleepover, everyone needs to be asleep. Set an alarm for the oddest hour and let it ring. Somebody will shut it down. Set about five alarms in different places. This will annoy your friends and get them totally out of sleep. Place a bucket of water on the top of the door. Let the room be dark so that your friend does not realize there is a bucket on top. Stay back and ask to open the door. The poor victim will be drenched even before she realizes it. You have to be real mean to play this prank. So get ready! You will easily get itching powder is a pharmaceutical shop. Buy some glue too. Sprinkle some itching powder in your friends socks with some glue. The unaware victim won't stop itching till she gets rid of it. Wonder how??!! You've got to be alone to play this prank. Pretend as though you have to step out at night, all alone. Once your friend is along inside, trip the power supply. Bring out your Halloween mask and knock the door. Voila! You'd better wish your girlfriend to be a little courageous. This is a rudimentary prank to pull. However, every time it has fresh humor to it. While your friend is asleep, take a toothpaste and let your friend's face be the canvas for your artistic skills. Do bother rubbing it off. The next morning dedicate the work of art to your dear friend. I am sure there might be a few guys on 'Dumb and Cute' list. Well, it's time you use your smartness with them. Call up these boys, pretending to be someone else and record their reactions. The next morning, break the new to everyone. What fun to begin your day with juicy details! Some of your friends must be sleeping with their mouths open. So what do you do with the left over Tabasco sauce? Pour it in, till it begins to blow out the fire like dragons! This is a simple one, but creates great ripples of laughter. Make sure your friend is fast asleep to play this prank. Take a red lipstick and write 'GOTCHA' on her forehead. When she wakes up in the morning, be ready when she'll be getting at you! Let your friend fall deep asleep. Quietly, sneak into your kitchen and get some tomatoes in the room. Slide in the tomatoes in your friends pants. While they toss and turn, the tomato will get squashed and get warm due to body heat. The victim will be royally embarrassed by the morning! Sleepover pranks are fun when done in good spirit. Some of the pranks ideas can be mean and make someone angry. As you'll be inviting your friends over, judge their temperaments and then pull the pranks. For tons of fun just do it anyway, because everything's fair in love and war!